Festival season has started, many types of sweet dishes are prepared, of them, besan ladoo is predominant. Besan ladoo is very well known sweet dish in India and this dish is liked by persons of all age group. This dish is, unanimously, known as besan ladoo all over our country (India). Basically,this dish is made from besan (gram flour/chickpeas gram flour), sugar and ghee(clarified butter). I am using khoya (mawa/dried milk) for better taste. It is not necessary to use khoya, if you don’t want to use it, you can prepare this dish without using khoya . You will be happy to know that, I am going to show you the very easy method of preparing besan lodoo. You will love to prepare this dish again and again. Let’s see the preparation of delicious besan ladoo. Place a wide bottomed frying pan on medium heat, pour ghee in it. After 1 or 2 minutes, lower the heat and add cleaned basan (gram flour) to it.Roast it until it starts leaving an aroma and turns to golden brown colour. It may take 15 – 20 minutes. Remove the pan from heat and leave to cool down. It will take 1 to 1 1/2 hours to cool down. Mean while you can prepare other things. Place another small frying pan on low heat, pour khoya/mawa in it and slightly roast it to remove the rawness of the khoya and to get pleasant aroma of it. Remember don’t roast thoroughly, if roast it thoroughly it will start leaving ghee out of it, which is not advisable for this dish. Make fine powder of sugar and cardamom separately and keep them in separate bowls. Crush dry fruits into little bit big pieces. 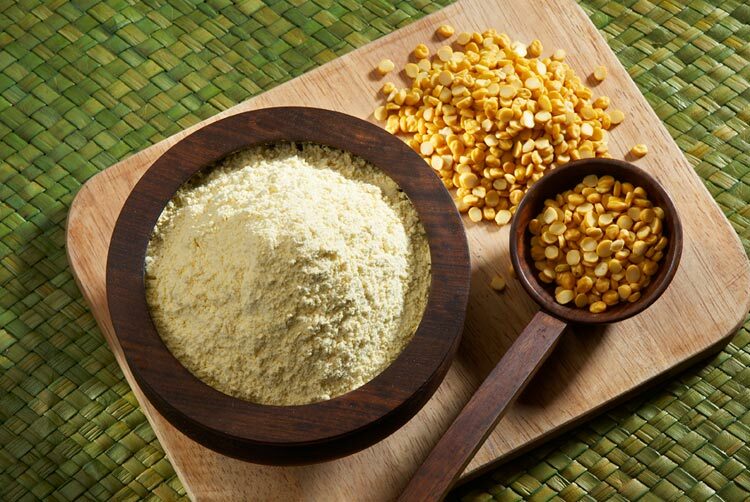 Check whether roasted besan (gram flour) cooled down completely or not, if it is cooled completely, then only add sugar powder, cardamom powder and dry fruits to it and mix altogether very well. Even if roasted besan is little bit warm, please don’t mix sugar, it will spoil the whole stuff, the stuff will spread out and you cann’t make ladoos out of it. Take a little quantity of mixture in hand, clump hands with mixture to tighten it. Slowly using inner palm, rotate it with another hand to make small balls. Your tasty and delicious Besan ladoo is ready to eat. You can store it in a bottle more than 1 month.